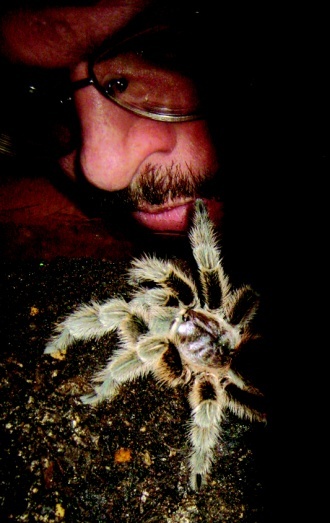 As a committed arachnophobe, I had to return to this photograph of author Gordon Grice and his pet Chilean Rose tarantula no less than twenty times before I could work out what I was seeing and feeling. This photograph began as a picture of my worst nightmare, literally. I read that this species is an ambush hunter: that doesn’t sound good. Several years ago, in pursuit of medication for a sick fish, I went to an aquarium hobbyist store in Chinatown, here in Toronto. It sold fish, many different species—all alive—and the surprisingly limitless paraphernalia that can come to accompany an aquarium. Little terracotta follies. Nets, oxygen tanks, etc. Out of the all the objects in the store (and the owner, if you want to include him, with all his fishy information), there were only four objects that didn’t fit the set. Two terrariums containing a tarantula each. Why the fish store owner chose to deviate from his remit in this way is unknown. I was fascinated and sickened by my reaction. The tarantulas were inert, maybe the most boring specimens on earth. They did not appear to move between visits. They did not appear to make burrows. They might well have been dead. They just sat there, like separate bumps on separate logs.